…open Heretics, such as Arius, Macedonius, Eutyches, Nestorius, etc. striking all of them at the Person and Natures of our Lord Jesus … All these Heresies were rejected by the Church and condemned by the first four famous general Councils. The first whereof was convened at Nice by Constantine about the year 305 wherein was condemned the heresy of Arius, who denied the God-head of Jesus Christ, or that He was by nature God as the Father was, though he accounted Him more that a man, and so differeth from Photinus. The second was at Constantinople by Gretian and Theadasius [Theodosius], Anno 380. In this was condemned the heresy of Macedonius, who denied the personality of the Holy Ghost, the third person of the blessed Trinity: His followers therefore were called … fighters against the spirit. The third was at Ephesus, under Theodosius the second, Anno 431. It condemned Nestorius, who made Christ to have [two] Persons as two Natures. The fourth was at Calcedon, under Martinnus, Anno 451. This rejected the Doctrine of Eutches, who, in opposition to Nestorius, attributed to Christ but one Nature, thus confounding his Natures, as the former had divided his Person. So, no Thomas Manton so far but fear not for he is below. But the absence of any posting was firstly due to accepting a job in London so we can go and live in Cambridge. This decision was a hard one to make but it meant we can be back in a presbyterian church so we accepted. Also Cambridge is a much better location while I am studying. This meant a whole load of work before we could put the house on the market. Then along came appendicitis. We were meant to go off on holiday on Saturday but I woke up with severe stomach pains and ended up in hospital instead of on the train to Scotland. So I have a week of thesis writing up to look forward to instead of a holiday! So, enough of me – on to Manton. I’ve often thought that one of the hardest texts to preach on (bearing in mind WCF 3:8 – “The doctrine of this high mystery of predestination is to be handled with special prudence and care, that men, attending the will of God revealed in His Word, and yielding obedience thereunto, may, from the certainty of their effectual vocation, be assured of their eternal election. So shall this doctrine afford matter of praise, reverence, and admiration of God; and of humility, diligence, and abundant consolation to all that sincerely obey the Gospel”) is Exodus 4:21 “I will harden his heart, that he shall not let the people go.” How can the doctrine that “God himself hath a hand in the hardening of obstinate sinners” (Manton, Works 17:221) be preached? I think Thomas Manton shows us how (Works, 17:221-240). Manton points out an important theological point we must safeguard when we come to verses like this, “God is not and cannot be the author of sin … God hath not brought upon any necessity of sinning; and God that is good, cannot be the cause of evil” (17:226). Allied to this “In the explication of this matter … we must not say too much, lest we leave a stain and blemish upon the divine glory.” (17:226). That is “God infuseth no hardness and sin as he infuseth grace. All influences from heaven are sweet and good, not sour…” (17:226). However, we must also avoid saying “too little” on this matter. We must proceed with care and caution to explain what this hardening actually means. So we must not confine hardening to “mere idle permission” or mere “desertion and suspension of grace … [though] this is a part but not all” (17:227). But positively hardening is “desertion,” it is a delivering them “up to the power of Satan,” it is “an active providence, which disposeth and propoundeth such objects as, meeting with a wicked heart, make it more hard” (17:227-229). How do we apply this to ourselves? “God delighteth not in judgement, and therefore he hath made a precedent once for all; here is Pharaoh set up, that all succeeding ages may stand in fear. God would not have us learn to our bitter cost, but take example by others. (17: 230). Although there are many other applications, surely this is the classic application of Ex 4:21. Intertwined with this doctrine of God’s hardening is the doctrine of common grace. Manton lists one of the causes of God’s hardening as “apostacy from grace received” (17:235). Heb 6:4-6 is the key text here. What I want to note is that despite the abuse made of God’s gifts and the hardening and condemnation they lead to, still the original gifts are called common grace. The abuse does not erase the original nature of the gift. If you want to see some of my thoughts on the value of Thomas Manton’s Works then they can be read here – thanks are due to Tony for being willing to discuss Manton with me! I’ll post something on Thomas Manton’s understanding of the hardening of Pharaoh’s heart on Monday, D.V. 1) Coffey argues that the allegation Rutherford had “relations” with his wife prior to marriage (which was the cause of his dismissal from Edinburgh University) was true (p38). I was not convinced that this is the most plausible reading of events e.g. the reference to Baillie’s letters (2:96) as providing another incidence of a man taken in fornication ordained a year later did not seem support this as the Synod were reproved for allowing the man to resume his ministry. 2) Coffey states “Along with Robert Bruce … [John] Welsh was a pioneer of the intense style of extemporary conversionist preaching which was to be imitated by younger Presbyterians like Livingstone, Rutherford and Dickson.” (p39) It is heartening to see someone else pick on the aim of so much of 17th C Scottish preaching – to convert sinners. My basic take from reading Rutherford and Coffey is that Rutherford was no theonomist! 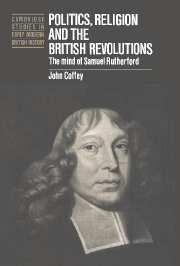 5) Coffey also notes how in many way the popular Rutherford is only half the man. The piety of his letters and sermons is what is remembered while his polemic works and his views on toleration are buried in obscurity. It is certainly true that my own home denomination has parted ways with Rutherford on toleration as the Free Chruch of Scotland in 1846 stated, “…the Church firmly maintains the same Scriptural principles as to the duties of nations and their rulers in reference to true religion and the Church of Christ, for which she has hitherto contended, she disclaims intolerant or persecuting principles, and does not regard her Confession of Faith, or any portion thereof, when fairly interpreted, as favouring intolerance or persecution, or consider that her officebearers, by subscribing it, profess any principles inconsistent with liberty of conscience and the right of private judgment.” There are other aspects of his theology which I am also not unhappy have faded in influence i.e. his supralapsarianism and his denial of the necessity of the atonement. Nevertheless Rutherford the theologian and Rutherford the polemecist do not deserve to be forgotten and hopefully Guy Richard’s work The Supremacy Of God In The Theology Of Samuel Rutherford will rectify that neglect.